MVISTM Air & Water Barrier is single component, load bearing, fluid applied, waterproofing, crack isolation, air barrier membrane. MVIS Air & Water Barrier produces a seamless, monolithic elastomeric coating and bonds directly to a wide variety of substrates. 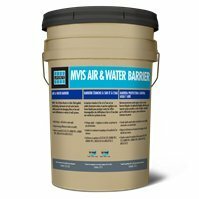 MVIS Air & Water Barrier is a low VOC, self-curing, water-based formula containing antimicrobial technology used in construction where air & water barriers are required to improve building efficiencies & durability. MVIS Air & Water Barrier is designed to enhance building longevity, save energy and increase building occupant comfort. If you have any questions about this product by Laticrete, contact us by completing and submitting the form below. If you are looking for a specif part number, please include it with your message. USEP Air Double Reflective Polyethylene Insulation Roll 2-Feet by 125-Feet Industrial Strength Commercial Grade No Tear Radiant Barrier Wrap Weatherproofing Attics Windows Garages RV's Ducts & More! Professional Grade Aluminum Foil Tape - 3.6mil (2 inch by 55 Yards=165feet） - Perfect for HVAC, Sealing & Patching Hot & Cold Air Ducts, Metal Repair, and Much More!